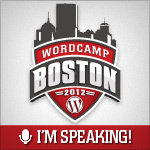 I’ll be speaking this year at WordCamp Boston! Date and time to follow as I learn more, but my talk will be titled “Old, New, Borrowed, and Blue” — we’ll be looking at the classic ‘Kubrick’ theme that shipped with WordPress until 3.0, and bringing it up to date with HTML5 and CSS3! The theme has traditionally used images to achieve the rounded borders and gradients it displayed. Fortunately, these are all achievable with modern CSS technologies, and in this talk, we’ll look at why and how we can implement them! Especially when trying to manage dropdown/flyout menus. I’m trying to sort out a way to make the WP core admin UI friendly to Mobile IE, but it doesn’t actually care about the `ontouchstart` event. At all. All it sees are clicks. Want a cheap O’Reilly programming book? Buy the iOS App from iTunes (it doesn’t matter whether you have an iPhone or not, and most of their books are around $5 as apps) and simply unzip the .ipa file on your computer. Poke around in the folders, and you’ll find the whole text of the book stored as plain html files — ready for reading on any device or computer. You might even find an easter egg like I did in my PHP5 book. Upon unzipping it, I found an epub version of The Adventures of Alice in Wonderland … presumably to just eat up space and make the app appear bigger.